“Constant starring on smart phones makes concentration impossible”. “If everybody is starring on their displays nobody pays attention to the exhibition”. “Smart phones are competing with the object on the wall”. These are the typical reservations towards tweeting in museums. In the following I want to outline the experience of our latest tweet-up in the Jüdisches Museum München (Jewish Museum Munich) and thereby counter the above listed preconceptions about tweeting in cultural institutions. The tweet-up took place in a concentrated atmosphere, the tweeters followed the explanations of curator Piritta Kleiner, who guided through the exhibition “Juden 45/90. Von ganz weit weg – Einwanderer aus der ehemaligen Sowjetunion” (Jews 45/90. From far away – Immigrants from the former Soviet Union), attentively. Eyes beamed lively from the exhibited objects to the curator to the displays of smart phones and tablets. The tweets of the listeners combined and condensed their subjective perception of the content, contour and atmosphere of the exhibition and the background stories of the expert. If the museum tells a story with its exhibition, the tweets potentiate the relevance of this story in digital space und function like a (international) multiplier, telling many stories from one subtext. This kind of reception (which is particularly not aiming for expert recipients but for a wider audience from different backgrounds) defines significantly sense and purpose of an exhibition. Tweet-ups enlarge and amend the classical mediation and communication of the museum in the 21st century. In most German museums taking pictures is not permitted. Copyrights, neighbouring rights and usage rights restrict and limit reproduction of the exhibits. I surely wouldn’t be the first one to demand a reform and reconsideration of existing rules. In times where “digital vision” (agitating with digital devices) become integral features of reception and marks communication with the larger audience of an institution, new legal propositions are necessary. Photographing serves as digital stocktaking and as personal adaption respectively cognitive documentation. Furthermore the shared pictures via platforms like Twitter, Instagram or Flickr show appreciation of the tweeting audience and the attempt of this tweeting audience to contextualise and promote the content in its own community. For many participants (as well as for many managerial staff, especially in Germany) tweet-ups are a new type of event. 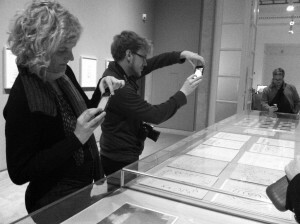 For curators and museum staff the prospect of guiding an audience made up of a physically present and frenziedly typing group and a “virtual” group of digital participants through an exhibition is unfamiliar and needs getting used to. 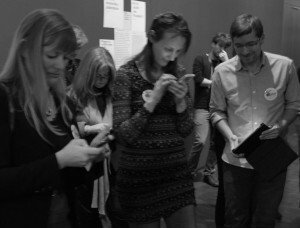 Connection between the individual participants on site, who do not only walk through the museum in a group but also come together digitally and as a group take responsibility for a collective live stream of news and messages. The participants interact dialogically and comment, evaluate and support each other’s communication. In accordance with the principle of cause and effect the on site audience documents its assessment of the exhibition tour immediately and makes this evaluation visible for a wider audience. Between guide and visitors develops a dialogic relation which goes beyond the classical culture of presentation and reception. Tweeting as state of intoxication and group therapy? While tweeting the mobile device functions as a tool of transportation into a narrative world. Twitter’s 140 characters message documents short subtexts to the own community and the co-readers of a tweet-up via the relevant hashtags. Thereby formal features of a tweet simultaneously tend into opposite direction: from essential to redundant, from concise to diffuse. Basically it seems: The more tweeters participate in an event the more intense and passionate the dialogue gets, mutual action intensifies (listening, photographing, reading, writing) into a gentle state of intoxication. However the tweet-up remains “staged communication” and writing via Twitter is an act of information. This act naturally serves the exchange of thoughts and emotions. The event itself has its own “dramaturgy”, meaning a specific course with opening, middle part, climax of different intensity and eventually a finale. 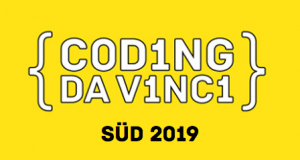 Furthermore the event has its own “symbols and rituals”: labelling of the own message with a previously agreed on tag (“hashtag”) or the common check in into the respective WLAN. In film (or gaming) we describe a process which completely absorbs the attention of the viewer as “transportation”: “transportation as a convergent process, where all of a person’s mental systems and capacities become focused on the events occurring in the narrative”. I don’t want to confuse tweeting with science, mostly it’s just “fun”, however I think that the intense participation in a tweet-up initiates a process which is comparable to the process of a “transportation”. This (subjective experienced) “transportation” would be a complex mental process which goes beyond simple reception of external information. Tweeters do not only listen to the guide (and possibly engage with the narration) but also personally “involve” themselves and actively establish references between the narrated and the own personal world. These references are communicated. Every tweeter could confirm the effort it takes: after a tweet-up you feel exhausted. August 2012 Tobias Becker published an article worth reading in KulturSPIEGEL about the literary qualities of Twitter: “Twitter is the ideal medium for aphorisms. It provides big thoughts in small format”. He concludes that “tweeters (…) use the medium as ultramodern wastebook which helps them observe the world more attentive; while writing, they think about it”. Furthermore he quotes literature professor Stephan Porombka, who examines the creative and pedagogic field of application of Twitter: “Cultural critics may think about it [Twitter] as irrelevant succession of trivialities. But they are wrong. Twitter functions as sketch- and notepad, in which new possibilities of present time narration in a network is researched”. With Porombka tweeting becomes a liberating dynamic act, as it maps the movement of thoughts and moves in a collective: “Noting and sketching is (…) done with ease. Sense of cursoriness rules. It matches with understanding in someone owns arbitrariness, insignificance and finiteness. Instead of avariciously gazing on ones own great piece of work, sharing matters. Individuality doesn’t produce itself anymore over what once was understood as totality. One only grows big, if one can share things here and now to others”. Even further goes a US survey which recently didn’t only describe Twitter as new literary experience but also as functioning and useful tool in learning processes for students: “twitter is evidently one of the best tools for learning and becoming an engaged student“. The survey outlines that Twitter can be used pedagogic useful and can especially have a positive effect on student engagement, active learning behaviour. Furthermore it supports dialouge with teachers, enriches discussion culture, reflection and peer review: “Young people’s varied use of Twitter in learning settings was found to support a number of positive educational outcomes, including increased student engagement, active learning, improved relationship between students and instructors, and higher grades. (…) They found that students’ use of Twitter was linked to a number of educative aims, including fostering “rich discussion of [literature] themes” through students’ directly addressing other students, peer questioning, and reﬂection”. I think the described aspects show that the application of participative digital concepts makes sense in educational providers. The concept of course shouldn’t stop with a handful of tweets, but should be pursued. A good example for that can be found on Michael Müller’s blog Culture to Go. It’s a wide subject.